Live Your Poem...: ARTSPEAK! 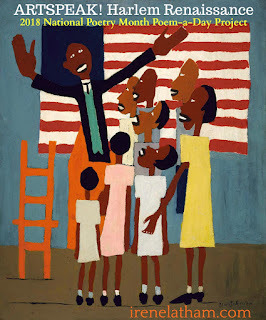 Harlem Renaissance poem "The Last Poem"
ARTSPEAK! Harlem Renaissance poem "The Last Poem"
Welcome to day #30 of 2018 ARTSPEAK!, in which I am focusing on art and artists from the Harlem Renaissance. I cannot believe this is the final poem of the series... whew! Before we get to today's poem, please be sure and visit Doraine at Dori Reads to read the final line of our Progressive Poem! Our little seed has sure come a long way. Today I'm concluding my Harlem Renaissance poetry project with a look at photographer James Van Der Zee. James started fooling around with a camera at age fourteen, and he went on to become the most famous portrait photographer in Harlem. He was known for his portraits of African American New Yorkers -- both prominent people and "regular" people. Read more about James here. Today's piece is Dancing Girls. I love the expressions on these girls faces -- so different from one another! I started out writing a variation of "Five Little Monkeys" but it just wasn't popping. Then I started thinking about how several of this year's poems have been ars poetica (about poetry), and I realized this was the last poem, and started thinking about how the dancers might represent the last poem, and voila!